The Escher String Quartet has received acclaim for its profound musical insight and rare tonal beauty. A former BBC New Generation Artist, the Escher has performed at London’s Cadogan Hall for the BBC Proms and is a regular guest at London’s Wigmore Hall. 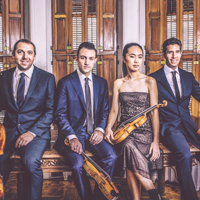 In its hometown of New York City, the quartet serves as season artists of the Chamber Music Society of Lincoln Center, where it recently performed quartet cycles of Beethoven and Zemlinksy. During the 2018–19 season, the Escher tours the United States extensively, performing in venues such as Alice Tully Hall in New York City; The Kennedy Center in Washington, DC; the Segerstrom Center for the Arts in Costa Mesa, California; the Harris Theater in Chicago; and many others. Internationally, it returns for a season-long residency at Wigmore Hall, where it performs three self-curated programs highlighting American and American-influenced compositions. The Escher String Quartet has made a distinctive impression throughout Europe, with recent debuts including Amsterdam’s Concertgebouw, London’s Kings Place, Paris’s Auditorium du Louvre, Slovenian Philharmonic Hall, Les Grands Interprètes Geneva, the Konzerthaus Berlin, and the Tel Aviv Museum of Art. With a strong collaborative approach, the Escher has appeared at festivals such as the Heidelberg Spring Festival, Kamara.hu at the Liszt Academy in Budapest, Dublin’s Great Music in Irish Houses, the Risør Chamber Music Festival in Norway, the Hong Kong International Chamber Music Festival, and the Perth International Arts Festival in Australia. Recordings of the complete Mendelssohn String Quartets, released on the BIS record label between 2015 and 2017, received the highest critical acclaim. The Escher’s most recent recording, which features quartets of Dvořák, Borodin, and Tchaikovsky, was met with equal enthusiasm. A two-volume set of the complete Zemlinsky String Quartets, recorded for the Naxos label, also earned high accolades, including a five-star review in The Guardian, which named it Classical CD of the Year; a recommendation in The Strad; Recording of the Month from MusicWeb International; and a BBC Music Magazine Award nomination.